Nithiin-Raashi Khanna’s romantic family entertainer, Srinivasa Kalyanam, released today. In the US, the film was premiered at 109 locations. Until the latest updates, Srinivasa Kalyanam has collected a nominal gross of $62,334 from the Wednesday premieres across the US. 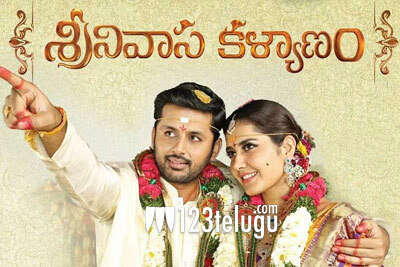 Srinivasa Kalyanam’s US premiere collections is the third highest in Nithiin’s career. His highest premiere collection was A..Aa’s $281K, followed by Chal Mohan Ranga’s $141K. It remains to be seen if Srinivasa Kalyanam will manage to pick up and post decent numbers over the weekend. Satish Vegesna is the director of Srinivasa Kalyanam and Dil Raju is the producer. Nandita Sweta, Jayasudha, Rajendra Prasad and Prakash Raj played key roles in the movie.